... but I didn't feel any tension or excitement because the choice was a foregone conclusion. Neither the audience nor the players had anything invested in the past selves since this is the first time we've learned about any of these tragedies. It's not really anything that has a quick fix, either, since spending too much time on backstory is kind of always a drag. Basically I'm glad we got this episode for the sake of learning about the characters BUT I wish all this info had come up earlier so the "choice" would have had more weight. Yeah. I did not for a second think the gang was going to make the wrong choice. It seems like Griffin didn't either, considering he built in a slow-motion witnessing of the death of Phandalin, including a dead puppy, to punish them. Magnus is too honourable to sacrifice duty for his love, Merle doesn't care enough about anything to go back if losing the arm is the worst regret he has, and Griffin gave Taako an out by absolving him of his guilt. So yeah, no way it was ever going to happen but this was still a super emotional episode. If the suspense didn't work, the episode certainly deepened the characterizations and retroactively made Phandalin a real tragedy instead of a recurring joke about incompetence, which raises the stakes for the decisions the gang makes in the future. The more I think about it, the more I like the episode. I only started listening with this arc - is it work going back to the beginning? Totally! This is one of the best, if not the best, arcs so far, but all of them have been pretty great. I tore through the whole thing in a few weeks. Re: next episode, I'm assuming June was using the chalice (shalice) to create those bubbles around the town and the worm. So uh... now what? I tore through the entire run in August. My other podcasts suffered but I loved it too much to care. Totally worth it. Okay, listening to the first episode, which is a bit of a gear-shift given the content of this episode. Taako the Acolyte? Merle worshiping some non-Pan deity? Magnus is pretty much the same. What does Taako say his deal is in that episode? I thought I always remembered him being a self-taught guy. He was an acolyte of Oghma and his last name is also pronounced "taco" but spelled differently. No cooking in sight. Things stabilize pretty quickly, re: early weirdness. If you make it to Barry Bluejeans, you'll be good. Ooh, Magic Brian's in your nearish future, robocop is bleeding! He's delightful. This has been a really great arc, but I do think this episode would have been better if we were already familiar with their tragic backstories. I like Clint as a comedian a lot, but sometimes as a player he annoys me-- it seems like, unlike the brothers, he shies away from committing to any kind of emotional depth of character in favor of repeated, obvious jokes. It really came out in comparison with Justin and Travis' backstories. It was obviously a foregone conclusion that they weren't going to go for the Temptation Option, but it was still a very cool concept episode overall. Would be nice if Clint weren't quite so flippant overall at times, though. It's true, but worth it all for the concept of Beach Dwarves. When they started, they were all new to D&D 5 and mostly new to RPGs in general; they started with the pre-made characters and the provided adventure in the introductory kit as they are trying to find their way. But Griffin takes it off the rails pretty quick, which allows for the characters to recreate themselves. Magic Brian. Oh gawd. The climax with Magic Brian happened while I was riding on a packed LRT car on my commute home; I think everyone around thought I was nuts because I was trying so hard to keep laughter in I was basically convulsing and letting out weird snorts. Yeah, Merle is still really a half-formed character in many ways - although I kinda like the idea of a cleric who is pretty laid back and kinda wishy-wash on faith generally - but the Beach Dwarves bit had me in stitches (part of it was that I think Clint had no idea about the concept of Mountain Dwarves and Hill Dwarves and when the idea was put to him he just rolled with it to Beach Dwarves on the spot) and they may just show up in a D&D campaign I'm thinking about. 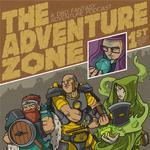 Although I don't have players yet and it's not going to be nearly as humourous as the Adventure Zone. Maybe Beach Gnomes. Correction - I think Merle and Taako were pre-gen characters; Magnus was created in depth by Travis before the campaign began, which might explain why he feels the most consistent. No, but I think (I don't know, I've been away from computer RPGs for years) that having dwarf subtypes is kinda unique to D&D, is all. I love the little solo segments. I can't decide how much of Merle's... blank slateyness? is intentional. I mean, Taako doesn't spend much time on self-reflection but it's clearly a character choice. Merle isn't as cut and dried. I agree he feels half-formed. I was surprised that their status as acolytes to the Goddess of Fate wasn't mentioned once, even if their decision was in line with her wishes. I know the players forget stuff fast but that was a huge repeatedly-hammered plot point. I actually really liked the concept in this one. Starting with Merle, who of course is too flippant to regret anything and only seems to miss his original arm inasmuch as it allows him to hold it over Magnus (who saved his life by cutting it off, let's remember) and knowing the stakes of falling to the temptation of one of the Great Relics, it indeed seemed impossible to make it plausible that any of them would fall. At least this would be an in-canon way to get their backstories in, though (they'd been hinted at before, pretty extensively in the case of Magnus and Taako in The the Adventure Zone Zone) so I was still on-board. And then Magnus, it turned out, had nearly the same backstory. And considering Travis's commitment to roleplaying Magnus properly, well, I believed that this could go pear-shaped.